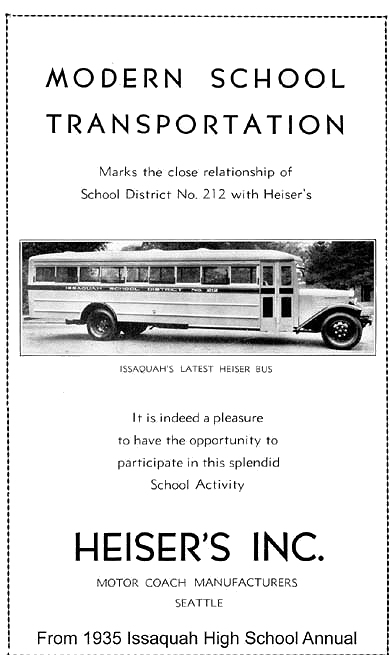 Issaquah school bus depicted in an “advertisement” in the 1935 Issaquah High School Annual. One of the Issaquah School District’s earliest buses is pictured in this advertisement in the 1935 yearbook. Heiser added the body to a frame and chassis likely made by the Kenworth Co. you might note that the school district was No. 212 at the time. It was changed to 227 in 1937, and became today’s No. 411 in 1944. Nearly all of the students in the 1930s either rode the bus to school or walked. That’s a stark contrast to today, when student parking lots are consistently overflowing.